You are currently browsing the Carpe DMM blog archives for June, 2013. The last day of this trip! I got up just after 08:00 this morning and packed my bags for departure. There was an itemised hotel bill slipped under the door. I noticed that in addition to the $18 breakfast I had on my first morning here, there was also an extra $37 breakfast charge in the same day! I pointed this out at reception when I checked out and they deducted the “second breakfast” charge. Then I left my large bag and poster tube with the baggage guy to pick up this evening before heading to the airport and walked out into the brisk morning air. It was really cold and a bit windy. The sky looked sunny ahead, but when I turned around, I saw the entire sky behind me was covered in angry grey storm clouds. I quickened my pace, hoping to make it to Millbrae before it began raining. The clouds threatened and I thought they were gaining on me, but by the time I got near Millbrae station, it was clear they wouldn’t burst quite yet. So I stopped quickly into the Panera Bakery near the station and got a whole grain bagel with cream cheese “to go”. I took my paper bag outside and opened it, expecting to find it ready to eat, but it was a sliced bagel, a plastic knife, and a peel-back container of cream cheese. So I stopped on a seat outside to spread the cheese on the bagel, discard the waste, and then walked to the station, munching the bagel on the way. At the station I bought a ticket. At the ticket machine next to me were a middle aged couple and an older woman (probably one of their mothers) and they were puzzling over the ticket machine. The asked me for help in buying tickets, and I told them as much as I knew, including that they needed a separate ticket for each person, which was news to them so it was lucky I told them. I got off the train this morning here at Glen Park Station, then went outside to catch a number 44 bus to Golden Gate Park. I didn’t need to wait very long, and the bus took a winding route north, skirting the west side of Twin Peaks, until it reached the park. There I got off in front of the Academy of Sciences, but before going in I decided to walk across the open area in front and check out the Japanese Tea Garden. This cost $7 to enter, and at first I thought it was very small for the price. But walking around I realised that there was a lot more hidden behind the trees and small hills, making it quite expansive. The gardens were beautifully maintained and the water in the ponds was crystal clear, giving an excellent view of the koi in there. There was a small school group and a few other people around, but not too many, so it was fairly tranquil. 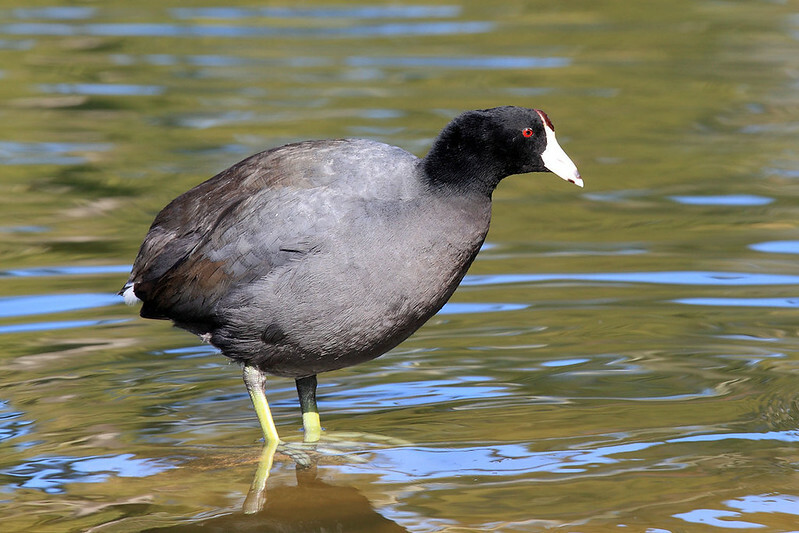 American coot, Stow Lake, Golden Gate Park. After exiting the gardens, I walked down the road past the botanical gardens to Stow Lake. I was surprised to find that the lake was actually uphill, the water level being higher than the main road that ran past it. The lake was beautiful, with lots of gulls, mallards, and grebes swimming around on the water. Quite a few people were taking advantage of the brightening weather to have picnics or just sit by the lake and admire the scenery. I am having a short mid-afternoon break before a final round of talks to finish off the conference in a little while. I snoozed in a bit this morning, getting up in time to have breakfast before a talk beginning at 09:45, about search engine user interfaces, particularly for image searching. Then I went to a bunch of talks about 3D depth acquisition and correction of noisy data, which took the time up to lunch. M. and I tried FaceTime again, getting a rather choppy video and audio connection, but enough to have a bit of a chat. Then I went out for a walk to Burlingame again to get some lunch. I’m glad I wore my coat today, as it was really chilly when the scattered cloud obscured the sun. It rained overnight and was still sprinkling this morning, but it seems to have cleared up now and the sun is shining. I tried a new place today for lunch, the Royal Donut Cafe, which was a classic style American diner. 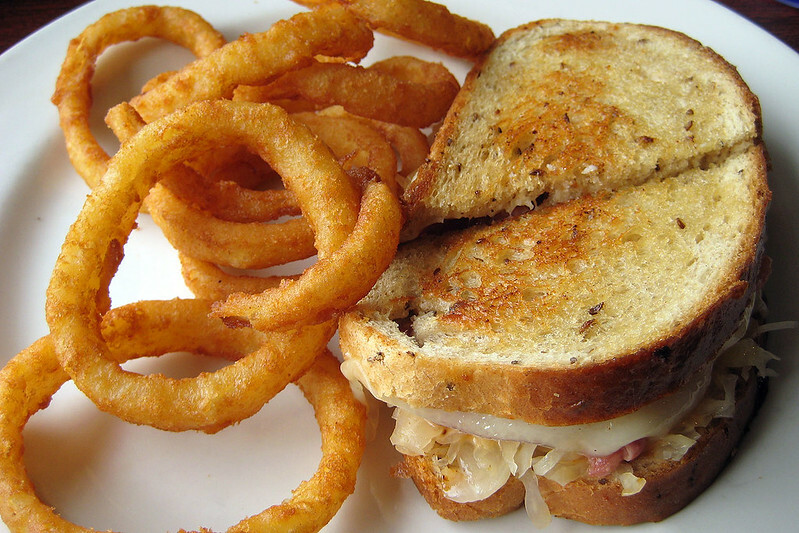 I ordered a Reuben with onion rings. I lifted the sandwich with my hands and tried to take a bite, but the corned beef was so tough I couldn’t bite through it! I ate the rest with knife and fork, slicing the tough meat into bite sized pieces. I was looking forward to something delicious and tender, so it was rather disappointing. After finishing that, I went back across the street to the Preston’s ice cream shop and this time tried a cup of rocky road. The texture of the ice cream there is marvellous – very thick and viscous. The only trouble was my hands froze while eating it as I was walking back to the hotel! Reuben and onion rings, Royal Donut Cafe. Part way back, I took a short detour to drop the cup and spoon into a bin in a park, and walked through the park to the shoreline road on the other side. From there I walked along the bay shore back towards the hotel, getting a good long view of Oakland across the bay and the airport runway with planes landing and taking off. Back at the hotel I relaxed for a while, having a shower to freshen up. I checked my email, and Lisa has organised everyone to meet at a restaurant called the Velvet Cantina, near the 24th Street BART station, which is convenient for everyone to get to. I’ll head there myself, walking over to Millbrae and catching the train from there. Now I just have to make sure I don’t forget to take the bags of lollies and the jar of Vegemite that I brought as gifts! I am sitting in a conference room waiting for the next talk. The one supposed to be on now was a no-show, and the next talk can’t start until the scheduled time, so we are all sitting here twiddling or thumbs for 20 minutes. This session is about 3D data processing. Before this, there was a plenary talk by Steve Seitz of Google about producing 3D models of the world based on photos uploaded by people. By matching points between about a million photos from Flickr he produced very impressive models of parts of Rome and Venice. Probably some of my photos were in the data he used! It was really mind-blowing stuff. Introduction to Steve Seitz’s talk. It looks like the poster display room is ready for setting up posters already, so I’ll go set up mine after this first session of the conference, during the morning coffee break. I’m having a break between the end of the poster paper session and the start of the conference reception. The talks I went to today were an interesting mix of stuff, mostly on 3D video, since the the sub-conference on digital photography didn’t have any more talks. Some of the talks even presented material in 3D and we were given glasses to view it. After lunch there was a very interesting panel discussion on how much depth effect to use in 3D content, with factors coming from all sorts of unexpected and surprising (to me) areas. The panel included a guy from IMAX, one from DreamWorks, a researcher in cognitive vision science, and a guy from a 3D production house that I can’t remember. For lunch I walked to Burlingame yet again, getting some pad thai at a restaurant I’d been in when I was here in 2011. The food was great and incredibly cheap, as I remembered it from two years ago. I have no idea why the place wasn’t full. I was the only person in there the whole time. I left a very generous tip. The afternoon was the panel session mentioned above, plus the two hour poster session. I’d put my poster up in the morning coffee break, but from 15:30 to 17:30 the authors were expected to be standing by their posters to answer questions and describe the work to interested readers. My poster was adjacent to one by another guy from Sydney, working at Sydney University. He had little koalas hanging from the corners of his poster! Towards the end of the session he asked me to introduce him to Clement at some point, as he was interested in the job position Clement had posted on the conference notice board. Several people asked me questions about my poster and I had to run through a full description of the work about ten times. It was good, but it made my throat a bit sore, talking for so long. I also didn’t get much of a chance to go around the room and look at the other posters there. In a while is the conference reception, with free food, and one free drink using the coupon I got in the registration package. I hope there’s enough food to stand in for dinner! I think there was last time I was at this conference. It’s coffee break time at the conference. I let myself sleep in this morning to get over the tiredness, and didn’t get up until 09:30. I missed a few talks, but I needed the sleep. I showered and had breakfast of two blueberry bagels and an apple. The bagels were good, but apple wasn’t as crisp and juicy as Granny Smiths back home. Then I went down to the meeting rooms for the rest of the morning’s conference talks. 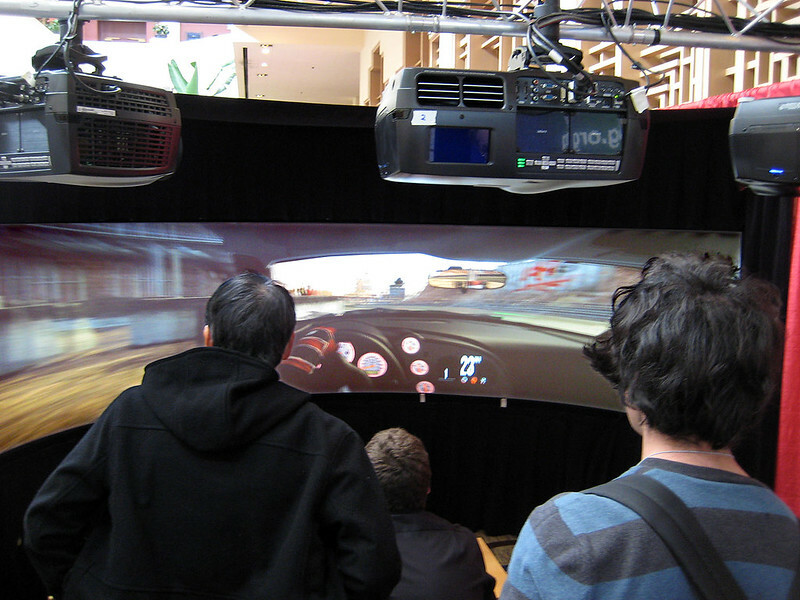 I attended some on 3D conversion of video and heard some stats which seem to indicate consumer 3D is here to stay. One paper was about the psychology of 3D, and whether people are more engaged in 3D than 2D, whether they enjoy it more, and whether “facts” presented in 3D content are more convincing than in 2D content. The results were interesting: based on objective measures of psychological engagement, viewers do find 3D more engaging, however viewers don’t find 3D any more persuasive about “facts”. And on the enjoyment side, people enjoy 3D sports and video games more than 2D, but showed no significant preference for movie content in 3D over 2D. Another talk was about depth grading, which is a similar process to colour grading in video production, but related to the placement of objects of interest in a video graphic scene within the 3D depth space of the viewer. The depths need to be adjusted so they are consistent between successive shots and objects of interest don’t jump in depth between shots, to avoid eye fatigue. 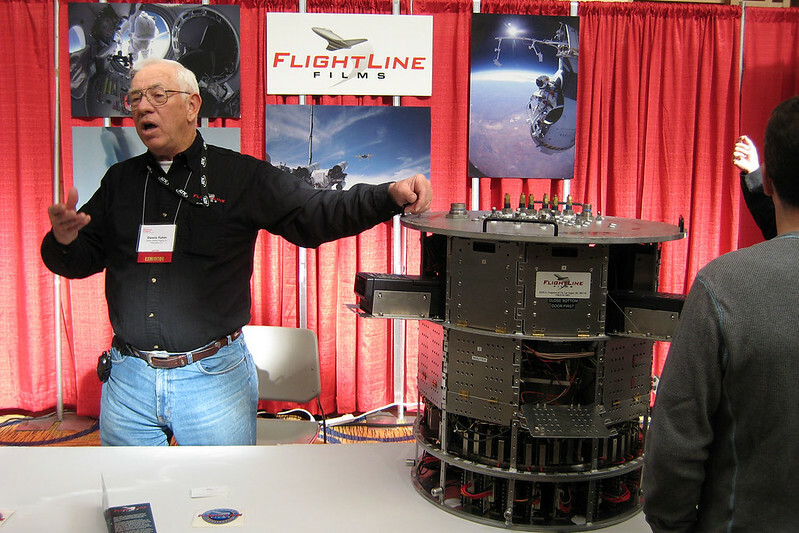 Between sessions I looked at some of the technical displays in the lobby area, which included one by FlightLine, a company with dedicated hardware for filming aerospace material. The have a truck parked outside my hotel room window, with high end video gear mounted on a pan-tilt turntable on the back, for tracking planes in flight. In the lobby inside the hotel they had two guys with some of the more portable hardware, including some of the camera packages that flew with Felix Baumgartner on his record skydive. The control and memory module was barrel sized and designed to withstand 10 Gs, and the guy said it was packed with dry ice to keep it cool. Then there was a camera housing with a Red video camera mounted with a Canon EF-S 10-22mm lens, a 5D Mark II with a 15mm fisheye lens, and a small live feed video camera. It has a massive heat radiator built in to get rid of heat, which is a big issue for high altitude where there isn’t enough air to carry away heat by convection. The were showing videos of the jump, and also some shots of the last Space Shuttle launch, which they filmed from their truck in HD video and shortwave infrared. I went outside to the truck and got to climb inside to see the control panels for all the gear. They had the cameras working, but there was nothing to see from where they were parked except the hotel building across the road. Flightline rep with the actual camera gear that flew and recorded Felix Baumgartner’s record-breaking free-fall jump. For lunch I walked down to Burlingame again and tried the other Mediterranean restaurant across the road from where I ate yesterday. This one had chicken kebab tacos on the menu, and the sounded good, so I tried those. They turned to to be really good, on soft tortillas, with a really spicy sauce to add on top. After that I went back to the candy store and got a cup of burgundy cherry ice cream to eat while walking back to the hotel. It was delicious – very much like Cherry Garcia only without the chocolate bits. The afternoon conference sessions went fairly uneventfully. After they finished at 17:00, I returned to my room and prepared for an evening out taking photos. I’d arranged to meet Lisa, who lives locally, at 17:30, and she would take me out to a few good spots to take night time photos around San Francisco. She arrived on time with her own camera gear and just before we left I showed her the Felix Baumgartner camera gear that was still set up in the conference area, which she thought was really cool. The first day of the conference is almost over. The talks have finished, and there is only the special event showcasing some of the best applications of 3D video starting in half an hour. Then after that I’m having dinner with colleagues from Canon. We have a yakitori place in Burlingame booked. I woke up just before 06:00 this morning, then snoozed until the alarm went off at 07:00, then snoozed a bit more until I got up and had a shower. I went down to the hotel restaurant for breakfast, having neglected to find anything yesterday to buy and be able to keep in my room to eat. There was a buffet, but I ordered a smoked chicken omelette a la carte. It came with a hash brown and sourdough toast and was very good. Then it was off to the first round of talks in the Digital Photography stream. Some talks were more interesting than others, but I took notes for all of them. There was a brief coffee break, then just before lunch I switched rooms to attend a talk in a different stream since it looked relevant to stuff I’ve been working on recently. On the way I bumped into Clement from work, and Francisco who works at Canon USA. We agreed to meet for dinner at the lobby right after the 3D video event tonight. Then I went off to my talk, which turned out to be a bit less relevant than I’d hoped. For lunch I walked down to Burlingame and got a felafel roll at the same “Middle Eastern” place where I had lunch one time in 2011. It was good, but I noticed an odd flavour in the roll, and realised there were thin spears of dill pickle in there! On the way back I stopped in at a fruit market and bought three large and good looking Granny Smith apples, as well as a bag of blueberry bagels. That’s breakfast for tomorrow and probably the day after sorted! I also stopped at an old fashioned candy and ice cream store, with a gorgeous old sign on the building that I took a photo of. I might try the ice cream another day. But this time I picked up a bag of “bloopers”, chocolates that had been messed up during production – the look hand dipped. I tried a couple just now and they taste great, one chewy caramel with what looked like sugar crystals on top, but turned out to be salt, and another with a creamy peanut buttery filling. 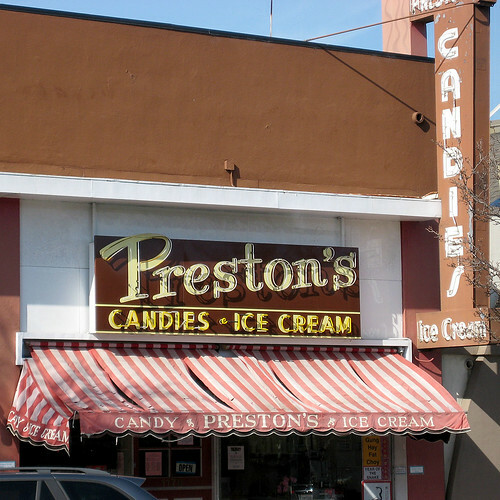 Preston’s Candies and Ice Cream, Burlingame. I am sitting here waiting for a train to San Francisco, after my flight from Sydney landed about three hours ago. The flight actually left Sydney at 16:20 Sunday afternoon (today), so I’ve arrived earlier thaI left thanks to crossing the international date line. The flight was notable only for a few small details. When I checked in at Sydney, they charged me $70 excess luggage fee for the poster tube I’m carrying to transport my conference poster. At least I should be able to claim that expense back from work. I also asked about an exit row seat, and the woman at the desk said United charges for those. It was $160. I thought about it for a second, and the thought of being in a normal cramped economy seat for 14 hours swayed me to part with the cash. I’m glad I did, because I’m sure my flight was much more restful than it would have been otherwise. As it turned out I had the middle of three exit seats, with guys either side of me, both of whom spent part of the time watching boxing videos on their iPad or laptop. The food was boring. The main point of interest was during the night when I had my eyes covered and was trying to snooze, when we hit some minor turbulence and the seat belt signs were activated. I heard a flit attendant ask a man standing in the open area near my seat to go back to his seat and fasten his belt. The man objected, saying, “If the plane crashes, I’m happy taking my chances here.” The attendant insisted and the man argued, saying, “You’re still walking around.” The woman patiently explained that it was her job, as it was also to look after the safety of passengers. The man refused to go back to his seat. Rather than escalate and make a scene, the attendant withdrew. I must have managed to get some rest on be flight, because I was wide awake for the breakfast service and landing on time just before 10:50. Unfortunately we then had a wait of over an hour to get through immigration, as several flights had landed just before us by the look of the queues. After slogging through the queue, there was at least no wait for the baggage, as it had all been unloaded and was piled up ready to collect. I also had to collect my poster tube from the oversized luggage collection area. Then I walked outside to the hotel courtesy shuttle area. I didn’t remember exactly how it had worked last time I came to the same conference in 2011, and asked a group of four guys who looked like they might be attending the same conference if they were going to the Hyatt Regency. They said yes, in New Zealand accents, and before we could say much else, the shuttle labelled with our hotel name pulled up. Five minutes later we were at the hotel and I checked into my room, getting one on the third floor with a view over the hotel carpark towards the airport and bay. I dashed back down to the lobby to collect my registration pack for the conference, then went back to the room and had a quick shower to wash off the travel grime. Refreshed, I set out with just my camera bag to head into the city. I walked north towards Millbrae, buying a banana at a small cafe along the way to tide me over until I can get a decent meal once in town. I’ve noticed lots of people already wearing San Francisco 49ers gear or with decorated cars for the Superbowl game on today. I’ve just asked a middle-aged couple sitting near me on the train, both dressed in 49ers gear, when the game starts. They said at 15:30, which surprised me as I’d assumed it would be later this evening. They are going in to meet their kids at a bar in town and watch the game on a big screen. I guess it’ll be a bit weird in San Francisco today! I took the train in to Embarcadero, getting off near the Ferry Building to see if the same woman who sold me the broccoli fridge magnet at the market there last time I was here was there. Some market stalls where there, but in various stages of packing up for the day, and I didn’t see the magnet woman. I wanted to get to Fisherman’s Wharf as quickly as I could to get some food, so I hopped on a MUNI bus at the Ferry Building, paying $2 and receiving a transfer ticket which was good until 19:00! As it turned, out, this proved useful later on. The bus dropped me off at the Aquarium and I walked the short distance to Pier 29. There were a few tourists around, but not very many. When I got to the pier, I saw the bar near the entrance there was full of people watching the Superbowl about to start on big TV screens. It was right across from Boudin bakery, where I wanted to get soup in a sourdough bowl. There was a bit of a queue, which gave me time to pick my soup from a choice of tomato, clam chowder, beef chili, or the daily special of yellow lentil with red peppers. I chose the beef chili this time, and took my meal out to the sunny tables outside, where I had a view across the pier to the TV screens inside the bar. From there I watched a bit of the pre-game stuff and then the kickoff as I ate. 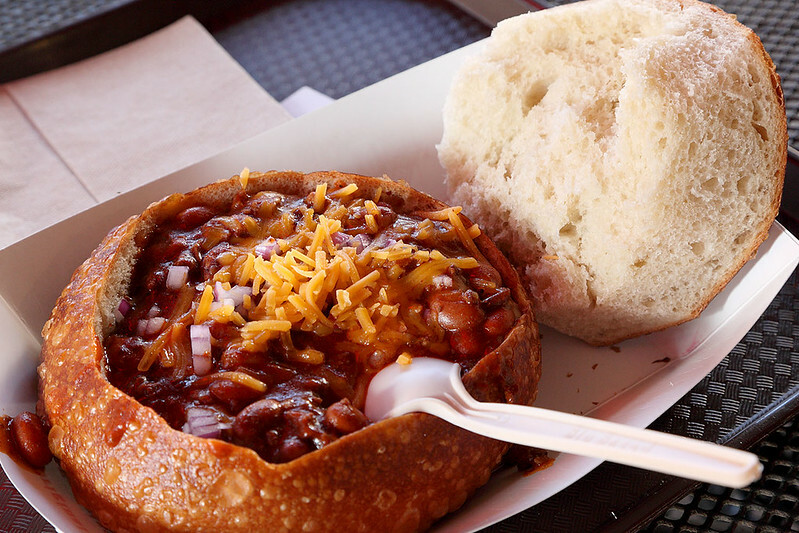 Chili in a sourdough bowl, Boudin Bakery, Pier 29. I didn’t linger though. Once finished eating the chili and the bowl (which was delicious; you really can tell the difference immediately compared to what passes for sourdough back home), I had a quick look around, taking some photos of the Queen Victoria ocean liner which was docked a couple of piers down the Embarcadero. Then I walked towards Fisherman’s Wharf, wondering where I could get a bus to the Exploratorium or Presidio to seek out the Yoda statue near the Industrial Light & Magic offices. As I walked, I passed a Ben & Jerry’s ice cream stall, so I had to stop and get a cup of Cherry Garcia. I asked the woman serving if she knew where I could get a bus to the Exploratorium. She said she wasn’t sure, but she thought it was that direction, pointing in exactly the wrong direction to where I knew it was located. When I told her it was near the Presidio she said, “oh”, and then pondered which bus I should catch, asking her co-scooper for advice. They couldn’t agree on the most likely bus number, so I said I’d figure it out and thanked them. Friday, 25 January, 2013. 16:24. Narita Express train to Narita Airport. I’m on my way home after a final day spent seeing some of the sights of Tokyo. I woke up at 06:30, but lazed in bed until 08:00, before rising and having a shower to wake myself up. After dressing I went down to the 7-11 to get some sushi for breakfast again. While eating, I checked my email and packed my bags for the trip home. A bit after 09:00, I checked out of the hotel and left my luggage there to pick up later, taking only my small camera bag with me. I hopped on a train to Ueno, where I got off and walked through the park there towards the Tokyo National Museum. This park was nowhere near as foresty and nice as the one near Meiji-Jingu, being much more open and having scattered deciduous trees which were bare for the winter. There was a large central square paved with concrete, around a pond and fountain. There were a lot of people around, including several groups of schoolkids. I presumed many of them would be on excursions to one or more of the museums in the park. I walked past the Museum of Western and Occidental Art, the National Museum of Nature and Science, and the Ueno Zoo, heading to the National Museum. Admission was a reasonable 600 yen, which I deposited in a machine with the help of a lady there, in exchange for a ticket to the regular exhibit. I didn’t have time to check out the special exhibit, so didn’t pay extra. The regular exhibit consisted of the contents of three separate buildings in the museum complex, and I entered the main central building first. I started on the ground floor, going clockwise around the loop of rooms that made up the floor. I realised the tour was probably intended to be done anticlockwise, and starting on the upper floor, as I began with fairly modern Japanese art and progressed to older stuff as I went around, and then even older upstairs. 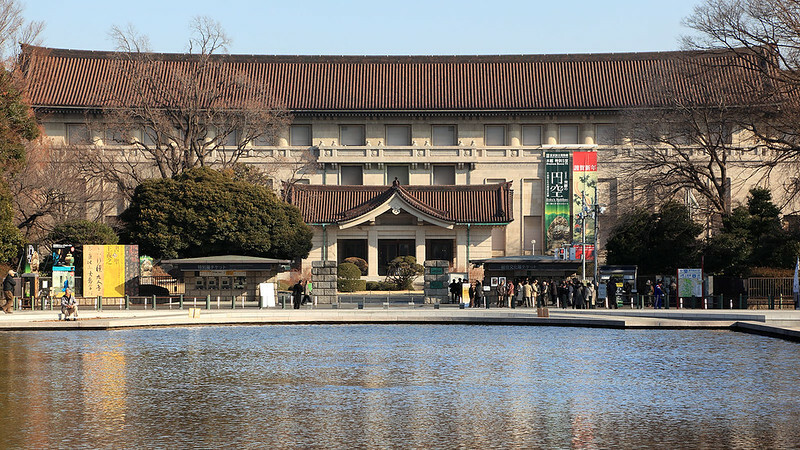 The exhibits consisted of various items including lacquerware, metalwork, samurai era weapons and armour, calligraphy, painted screens, pottery, ornamental ware, kabuki and noh masks and costumes, paintings, woodcut prints, and some spectacular decorated silk robes and other fabric items. Once that was exhausted, I went to the second building, which was Asian art from non-Japanese cultures. This included works from China, Korea, India, Khmer works from Cambodia, and, oddly, a few Egyptian antiquities including a mummy and two large granite statues of Sekhmet. 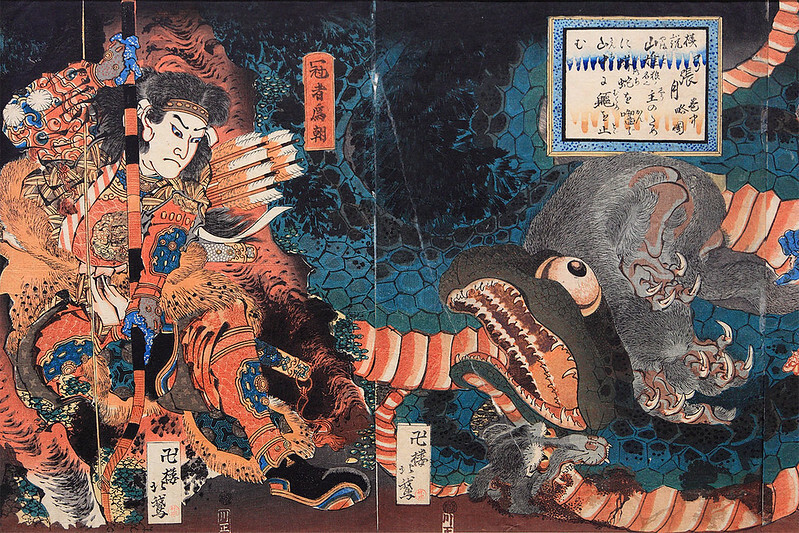 Painting of samurai, Tokyo National Museum. By the time I was done, it was just after midday and I was hungry and footsore. There was a restaurant attached to the Asian art building, so I went to have a look. I’d thought it was a cafeteria, but it was a full-on restaurant, although fairly casual looking, with posters of the available dishes displayed outside. I spotted a tempura-don and that convinced me to go in. It turned out I had to add my name to a waiting list – on which every other name written above me was in Japanese. Fortunately, there were only two parties ahead of me and I didn’t have to wait long for a table. I ordered the tempura “ten-don” and an orange juice. The food arrived on a lacquered wooden tray, with a large covered bowl and a small covered bowl, plus a little tray containing pickled radishes and a covered ceramic cup. The large bowl contained the rice and tempura, the small bowl miso soup, and the cup contained what looked like custard. I tried it with the small spoon provided and found it to be savoury, and covering a layer of fish and prawn pieces. I realised it must be a chawanmushi. The food was all good and really hit the spot. After paying, I went over to the third building in the regular exhibit, an ultra-modern piece of architecture with lots of straight lines and a big reflecting pool out the front that you cross on a causeway. This is a smaller building and contains a special collection of items which belonged to a former emperor or something. (look this up) There were kept in very dimly lit rooms for preservation, and consisted mostly of bronze statues and other metal items plus some pottery. 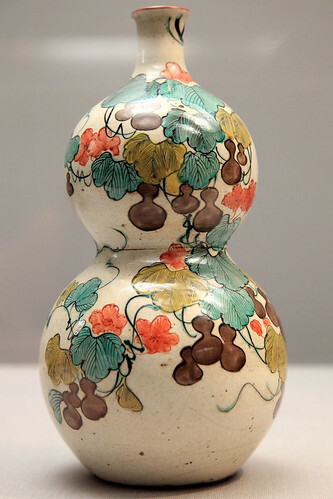 Glazed vase, Tokyo National Museum. Leaving the museum, I was tempted by the Nature and Science museum, but figured I didn’t really have enough time to do it justice. 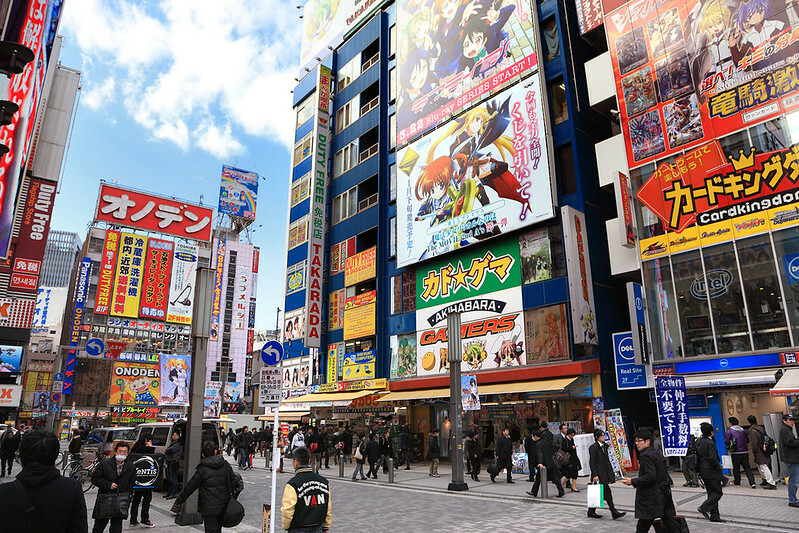 So I headed back to Ueno station and caught a train two stops to Akihabara, to browse around the electronic goods shops there. Akihabara was confusing, as the station had several exits. I picked the one labelled “Electric Town Exit”, figuring that sounded the most promising. This dumped me on a street lined with glary manic signs and all manner of shops peddling odd wares. Walking around a bit, I noticed that many of the places were tiny stalls selling electronic components: cables, lights, switches, capacitors, and so on. There were also several places that looked decidedly dodgy, covered in advertising featuring scantily clad woman, both real and anime drawings. I decided to try my luck on the other side of the station, which had a large building covered with neon advertising electronics brands. This turned out to be the Yodobashi electronics store, which is really more what I’d been seeking in the first place. Its 9 levels are all filled with electronic consumer products of all sorts. There’s a floor for cameras, a floor for computers, a floor for TV and video, a floor for household appliances, and so on. I went to the floor for toys and games, which featured a lot of video game stuff, plus quite a bit of other random hobby stuff like collectible cards, model vehicle sets, puzzles and so on, plus children’s toys and a section for outdoor things like bicycles and skateboards. I grabbed a card deck box and a couple of weird Rubik’s cube variants that I’d never seen before. It was getting time to be heading back to the hotel, so I hopped back on the train to Shinagawa and collected my luggage from the hotel reception. I sat for a bit in the lobby and repacked my bags slightly, putting my large camera and scarf into the luggage for the flight home. Then I headed out to the station to catch the Narita Express train to the airport. The sun is setting as the train makes its way to Narita. The views of the city passing by are fascinating, and now the train is in countryside, with fields and trees and only the odd building here and there. My flight home just goes from bad to worse. When my work booked it, economy class was sold out, so they got me a premium economy seat. And when I arrived here to check in, they said very apologetically that premium economy was full, so they were upgrading me to business class! And they gave me access to the JAL Sakura Club Lounge! With free food and drinks! I was planning to buy dinner here at the airport, but it turned out I don’t have to. I got some rice with seaweed, topped with a selection of vegetables and some sort of tofu balls I think, in a thick sauce, then had some salad, and some fruit salad as a sweet. I actually didn’t want to stuff myself because I’ll probably get a good meal on the plane shortly after take-off too. So I’m comfortably full and relaxing in a deep armchair, watching the planes out the panoramic window, while I wait for my flight. This is much nicer than wandering around looking at the shops with the crowds. Still, I can’t wait to get home. 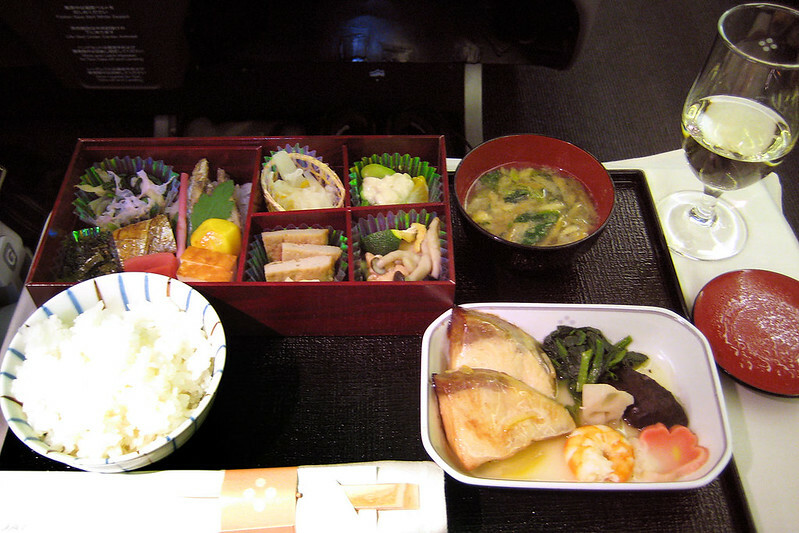 Business class in-flight meal on JAL. After finishing this off, I reclined my seat back into the almost full horizontal sleeping position, donned the complimentary eyeshades and earplugs, and relaxed. I didn’t really feel like I slept, but I must have because I was thinking we were about an hour after the dinner when they started serving the breakfast snacks. I remained inert as I wasn’t hungry yet and they let me rest undisturbed. Before I knew it we were into the landing routine. Upon landing, I got a breeze through the immigration and customs. I was hoping to get through quickly, but was horrified to see about three other large planefuls of people ahead of us. The queues at immigration were several hundreds of people. However, I moved to the “smart” immigration check with my electronic passport, and got through the computerised identity check in a couple of minutes, thus bypassing most of the crowd. I had no checked bags, so went straight to customs, where I was waved through without a second glance after I declared I was carrying some boxes of sweets. I was out of the terminal and in the taxi rank a second later, and there was no queue there, so I was off straight away! I was home within 40 minutes of the plane hitting the runway – a record that I can’t ever see being beaten in the future. The first two days of this trip to Japan are written up here and here, posted back in January. I thought I should post the rest of the trip some time! I am having a break after my last meeting for the day, before my business partners here take me out for dinner. The day began with me waking up early again, and getting up just before 07:00. I showered and dashed down to the 7-11 to get some sushi for breakfast again, and munched it in my room as I finished typing up yesterday’s diary. 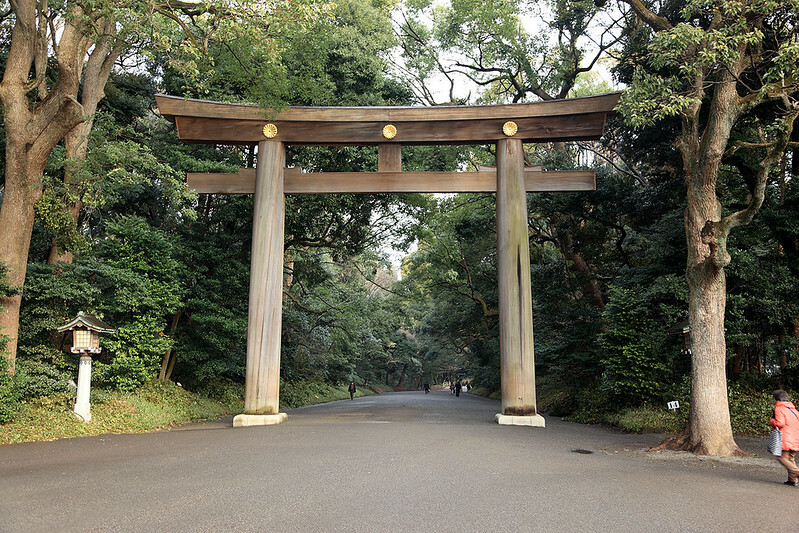 I was ready to leave about 08:30, rugging up for a morning spent outside exploring the Meiji Shrine. I caught the Yamonote line train one stop past Shibuya to Harajuku. Leaving the station, I turned across a bridge back over the rail line and into the large forest park which surrounds the shrine. The trees were mostly broadleaf evergreen types which I was unfamiliar with, so the forest was deep and dark green, even in the winter. There were piles of unmelted snow in many places. There was a broad path covered with small pieces of crunchy gravel, leading under a huge tori gate into the depths of the forest. I’d arrived early enough that there weren’t many people around, though not long after some tour groups began arriving. I strolled along the path, crossing a stone bridge, and then past a display of traditionally colourfully painted sake barrels arranged in a long wall along one side of the path. Opposite the sake barrels were oak wine barrels, with a sign explaining that they were from Bourgogne in France, to be blessed here at Meiji on a sort of cultural exchange between France and Japan. Past these, the path turned left, heading past an entrance to an inner garden, then doglegged right again before arriving at the Meiji shrine itself. I performed the ritual of purification at the small fountain by the entrance, scooping up icy cold water in a bamboo ladle, washing my hands with it, and rinsing out the mouth. I’d read how the ritual goes in a guidebook, but there was also a helpful sign there explaining it in English. It was really quite cold so the water on the hands was almost painful until it dried off. Then I walked inside the shrine to explore. I hadn’t known quite what to expect, and thought the place would be taller, but it was essentially a large courtyard surrounded by low walls, with gates at the centre of the four walls. I entered through the south gate. The north gate led to a second, inner courtyard, but it was roped off and you weren’t allowed in. East led to another smaller courtyard which I explored, and west led out of the shrine and back into the forest. Soon after I arrived, a procession of about 30 people, men and women, dressed in white Shinto robes with brightly coloured sashes of various colours, entered and walked in line around the shrine and to the inner courtyard, where they started performing some form of ritual involving chanting and bells or gongs. Around the inside walls of the shrine were panels covered in large Japanese calligraphy. The architecture was beautiful, very traditional Japanese in style. Apart from a few other tourists and visitors, the place was mostly full of firefighters and emergency teams in uniform, running around with fire hoses and megaphones and stuff. It appeared to be a full on fire drill of some sort, and there were even two bright red fire engines parked outside the east and west gates. At one stage three people in Shinto robes went running across the shrine carrying fire extinguishers. There was obviously no real emergency, as nobody directed any of the visitors to do anything, but it was kind of weird. 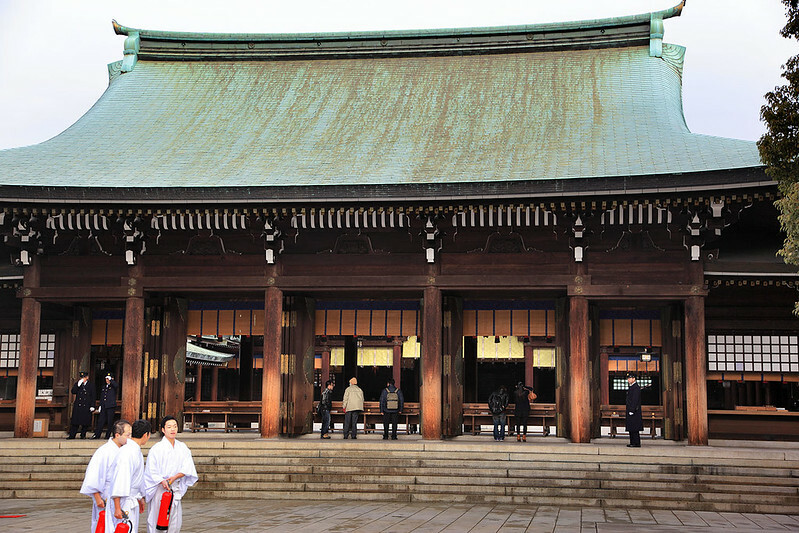 Shinto monks in Meiji-Jingu (with fire extinguishers!). Leaving the shrine, I went back to the garden entrance and paid the 5000 yen “maintenance fee” to enter. This was well worth it, as the garden consisted of a maze of narrow paths winding among the trees, leading variously to a spring and well that signage indicated was historically important, beds of what would presumably be beautiful flowers in spring but were now covered in snow, a gentle hill covered in carefully groomed shrubs leading up to a traditional Japanese ceremonial house of some sort, and a large pond. The pond was half covered in ice where the sun was obstructed by the overhanging trees, but large carp and koi goldfish could be seen eagerly waiting for food near the approachable bank. It was a lovely scene. As I was about to leave and continue walking around the paths, an old man indicated to me with gestures of wings and pointed at a spectacular blue bird sitting on a twig over the pond. I thanked him and took some photos, then turned around to see him feeding some other small birds, brown with bright orange and yellow markings, right from his hand. He posed for photos with a bird on his hand, then offered me a peanut and indicated to hold it out. I did so, and a couple of the birds in succession flew down, landed on my hand, and pecked little bits of the nut until it slipped out of my fingers and one bird flew off with the whole thing. 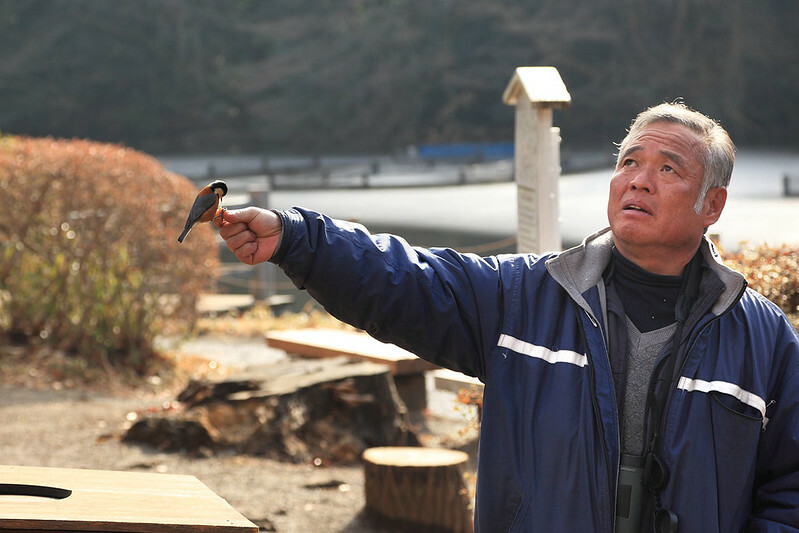 Man feeding birds in Meiji-Jingu gardens. I could have spent longer here admitting the garden, but with time slipping away I took a path back to the entrance and headed back out along the broad path to Harajuku station. I figured I’d just about have time to stop off at Shinagawa to collect my laptop and business notebook, then head to Shimomaruko and stop for lunch at a local dining establishment somewhere there before my appointment at Canon. As it turned out, the train trips took a bit longer than I’d anticipated, and by the time I got to Shimomaruko I only had half an hour to my appointment time. I remembered the 7-11 near the station and went there, intending to get some take-away food, but then I noticed a local sushi shop across the street. It looked much more inviting than 7-11, so I went over and looked at the offerings, which were apparently being made by a lady working in the kitchen behind the display. She paid me no attention and I wondered if she’d come ou to serve me, when I realised that the display had sliding glass doors that I could open to select what I wanted. When I did so, the woman moved out of the kitchen to a cash register on the side and took my money for the sushi. I took the sushi to the small park I’d passed yesterday and sat on a bench to eat it. A horde of pigeons approached as I opened the food, but rather than being annoying and persistent, they cleared off again pretty quickly. I guess they had no patience. The sushi was better than anything I would have got at 7-11, that’s for sure. That finished, I wanted something sweet to take away the saltiness of the soy sauce, and had a look at the fruit stall nearby. My eye was drawn to what looked like very large dried apricots, packaged in threes. I picked one up, and found they were about 2 centimetres thick each. I figured they weren’t apricots, but I had no idea what they were. I decided to buy them anyway, and ate them while walking down the street to Canon. I think they may have been semi-dried persimmons, but whatever there were they were juicy, sweet, and delicious, with no seeds at all, but a hard stem attachment at one end. I made it to my appointment with a minute to spare, and was whisked off again into the world of business meetings. After some discussions, followed by presenting my current planned work to a room full of intimidating bigwigs and senior managers, I breathed a sigh of relief as a more junior worker escorted me to a room to wait for our dinner excursion after knock-off tonight. I am back in the hotel after a very interesting and enjoyable meal with the guys from work. There were six of us all together, and we left the Canon offices at about 17:20, walking back through the village to Shimomaruko station, where we caught the train to Kamata and then changed on to a southbound train for the one stop to Kawasaki. Here we alighted amidst crowds of commuters heading home and made our way into a large shopping centre. Our destination was on the fifth floor, but it appeared none of the guys had been there before and we took a roundabout route that involved climbing up three floors in the fire stairs. Eventually we got the restaurant and were shown to a table next to a panoramic window overlooking the bustle and bright lights of the street below. I was given the seat farthest from the door, which I’d read in a guidebook was the custom for special guests. 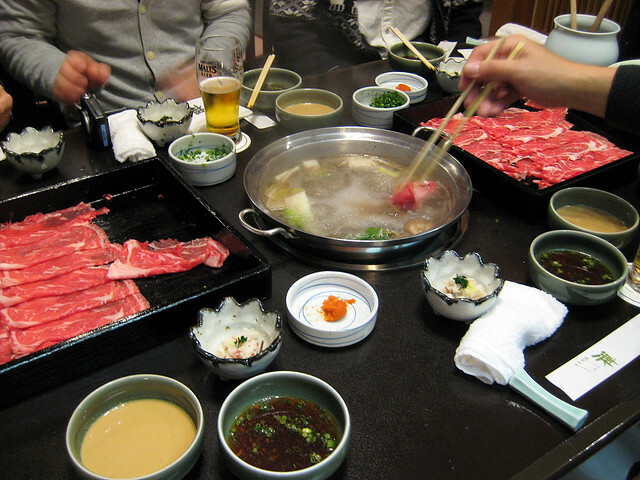 The restaurant specialised in shabu-shabu, which we’d looked up on the net just before leaving work, resulting in the Japanese guys learning the new work “onomatopoeic”, “shabu-shabu” being akin the sound made when swirling thinly sliced beef through boiling water with chopsticks. For this is how we cooked our meal ourselves at the table. A boiling pot of water was inset into the middle, and the waitress in a kimono brought out plates of paper-thin beef slices. She placed some cabbage, mushrooms, and tofu into the boiling water, then let us serve ourselves. Waving the beef slices in the boiling water cooked it in just a few seconds, and then we had two bowls each into which to place the hot beef, one containing a light soy-based sauce, the other a sesame sauce. There were also condiments of chili and daikon, chopped shallots, and another one which I didn’t quite get, but which appeared to have tiny pieces of raw fish mixed with a grated white substance which could well have been more daikon. We started eating the beef, then people began fishing out the vegetables and tofu as well. There were also mochi pieces, and when I said I liked mochi, they dumped several in, suggesting I wait a few minutes before pulling them out. When I did so, the mochi was very soft and gooey, difficult to grab with the chopsticks, and stretchy like hot mozzarella. It was chewy, but yummy with the sesame sauce. As we finished off the plates of beef slices, the waitress brought more. And more. And more. We must have gone through about 20 plates of beef slices before some of the guys started patting their stomachs and claiming to be full. And still more beef came! I was completely stuffed, but everyone kept eating slowly for another half hour or so, until eventually we could do no more, and waved at the waitress for dessert. I told them about the Australian tradition of the “dessert stomach”, and they said in Japan they had the same thing, calling it the “second stomach”. As it turned out, the desserts were very small serves of ice cream. I got honeydew melon flavour, while others got green tea or yuzu, a type of citrus fruit. The dinner done, we walked back to the station. The manager suggested I catch a Tokaido line train instead of the usual Kehin-Tohoku line I would have caught, as the Tokaido was an express which skipped all the stations between Kawasaki and Shinagawa. We shook hands and waved goodbye, and I headed down to the platform to get my train. I had a five minute wait, but the train was very fast indeed, and I got back to my hotel around 21:00. I picked up my second green cleaning voucher from the hotel reception (a 5000 yen bonus if you elect not to have your room cleaned). With two of them now, I went down to the hotel convenience store to spend them, picking up some souvenir lacquered chopsticks and an ice cream sandwich to make up the value almost exactly. And now, it’s time to turn in for the night, ready to head out tomorrow for some last minute sightseeing before heading to the airport in the afternoon. We woke up and walked down the street a little to the Cafe Rue de Marché, which we’d spotted yesterday, for breakfast. It looked very French, with appropriate decorations and some large framed black and white photos of Paris on the walls. The menu was very French too, and we assumed the owners must have come out from France. I ordered an omelette and M. got the muesli with sliced apples and pears and honey. Mine came with toasted sourdough, baked on the premises, and M. got a side order of toast as well. 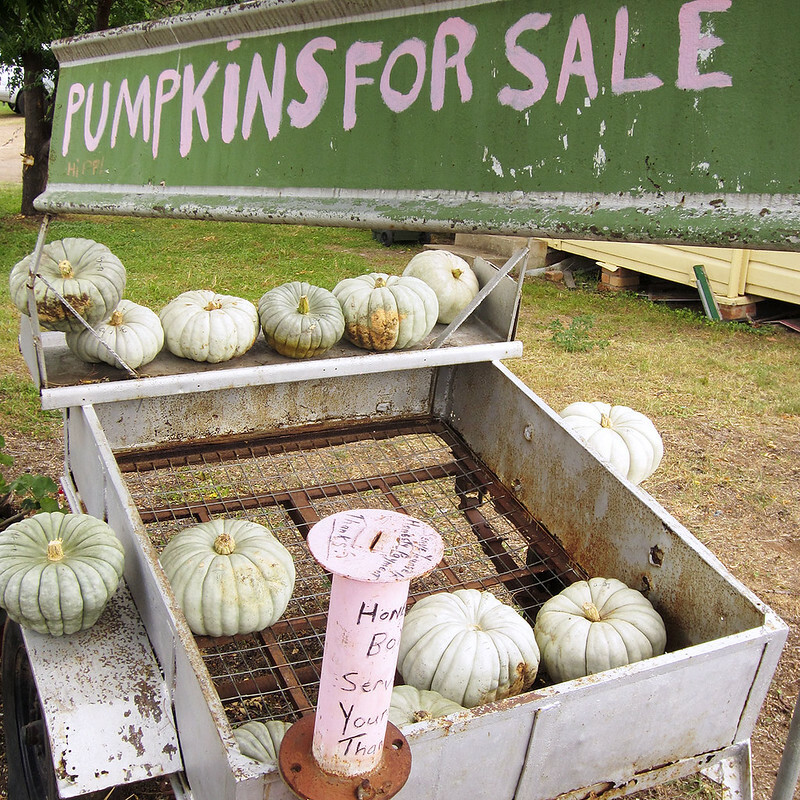 There were all sorts of jars of pickles and jams and things for sale, as well as jars of honey, and freshly baked bread and muffins. It all seemed beautifully French, until we saw the chef in the kitchen through an open doorway and saw that he was about as ocker as you could get. 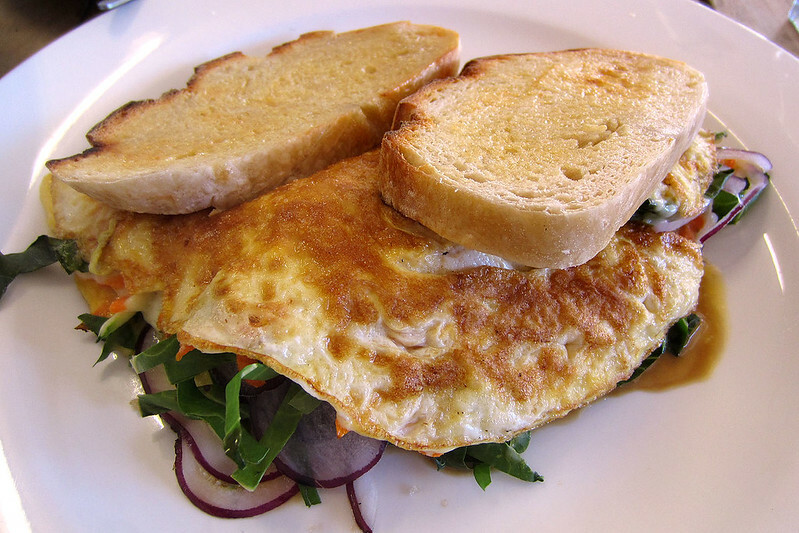 French omelette at Cafe Rue de Marché. After a leisurely breakfast, we checked out of the Cobb & Co and then set out in the car. Our first stop was the Mudgee Honey Haven. This place had more different types of honey and honey products than you could shake a stick at, as well as products made from beeswax. We browsed the three dozen or more different types of honey, buying a large jar to take home. We also bought a bottle mead wine, a bottle of mead liqueur, and a bottle of non-alcoholic “sparkling honey”. Road between Wollar and Denman. From there we drove out of Mudgee, taking the road north-east to Wollar and across the mountains east of there. This was a scenic route via the Hunter Valley, rather than the direct route south-east to Sydney via Lithgow. The road was fairly empty of traffic and made a pleasurable drive through the countryside and then into the mountains. We stopped for a snack and drink break near the top of a mountain pass, with a good view down into the valley below. We emerged on the eastern side of the mountains at Denman, where it was time to stop for lunch. We found a cafe in the single block of shops that formed the town’s main street. It was actually a house that had been converted into a cafe, and we got a table in a back room, looking out a window to the back yard. M. got a salad sandwich while I had the chicken burger, which came on Turkish bread and was really good. Leaving Denman we drove down a back road, Bureen Road, to the Golden Highway, then down Wallaby South Road to Broke and then Pokolbin. Pokolbin is the heart of the lower Hunter Valley wine region, and we took the familiar road to McLeish Estate Winery, owned by the uncle of a friend of ours. We bought a few bottles of our favourites and tried a couple of new things since we’d been there last. 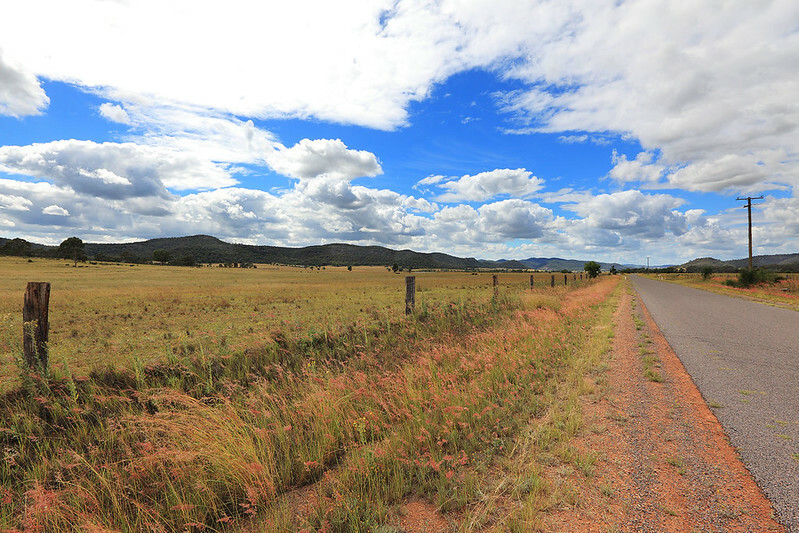 From the winery, it was a drive along familiar roads all the way back home, completing the loop by arriving in Sydney from the north.